"We are constantly coming up with new ways to keep our electronic devices protected. While our IQ Shield is designed specifically for flat screen surfaces, we’ve also engineered a film that is able to completely cover your entire Samsung Galaxy Tab A 10.1 (2016, SM-T580)! Our IQ Shield film is pliable, allowing it to wrap itself against round edges and corners, but tough and highly durable to withstand physical wear and tear. Exposing excessive amounts of water or other liquids may cause harm to your device. 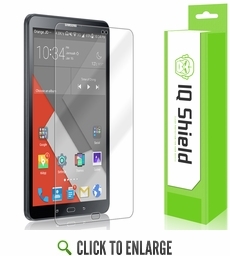 IQ Shield will not be responsible for damage caused to your device due to excessive use of liquids or improper installation."